Gravity-fed self-unloaders with hoppered holds and gravity gates are the mainstay of CSL operations around the world. 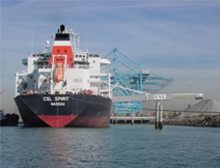 These vessels are suitable for granular free-flowing cargoes. As the name implies, these vessels use gravity to release cargo through gates located at the bottom of the vessel's cargo holds onto conveyor belts running beneath the cargo area. The cargo is then transported to an elevating system, lifted above deck level and transferred onto a discharge boom conveyor. 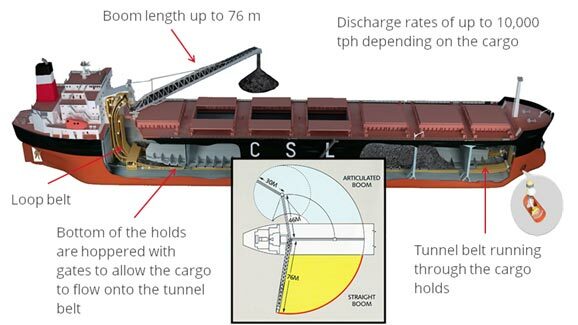 The cargo is offloaded via the discharge boom, port or starboard, depending on the unload facility. Loop belt, incline belt and bucket elevator self-unloading systems are all gravity-fed technologies.